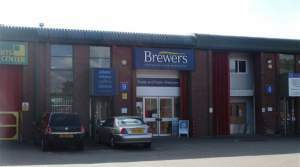 The Brewers Decorator Centre in Twickenham has been providing paint supplies and equipment to trade and retail customers in Twickenham for more than 20 years now, and we have a small but experienced team ready to help you. With more than 30 years’ Brewers training and knowledge, we know our products inside out and can help you locate and source trade and designer paints, wallcoverings and any other decorating essentials you may need. All you need to do is ask and we’ll do all we can. We're about a five-minute drive from the home of rugby. You’ll find us just off the A305 Heath Road near the railway bridge known locally as ‘the dip’; take the Heath Gardens turning – you’ll see the Blah Blah Blah restaurant and a postbox on the corner and Twick Barbers and Websters Estate Agents directly opposite. Heathlands Industrial Estate is your first right, 30 metres down the road. We have parking right outside and the store is easy to access for people with reduced mobility. Travelling on Heath Road towards Twickenham Green, before going under the railway bridge, take the left hand turn on to Heath Gardens and then immediately right on to Heathlands Industrial Estate. From the A305 Staines Road, continue past Twickenham Green and under the railway bridge. Take the first turning on the right on to Heath Gardens and then immediately right on to Heathlands Industrial Estate. The entrance to Heathlands Industrial Estate off of Heath Gardens.